One of the things I noticed at times of great organisational change in the NHS was the way that people took the opportunity to invent new titles for themselves. As far as I could tell, there were three reasons why they did this: 1) to make themselves sound more important, 2) to discard a devalued title, and 3) to bump up their salary grade. You can’t really blame them for one and three – a bit of self-aggrandizement goes a long way and who couldn’t use a pay rise, but it’s the middle one that I find a tad sinister. I was thinking about this when I came across someone whose title is Interim Head of People Service. ‘What on earth is that?’ I thought until the penny dropped that this was latest incarnation of human resources. When I first started work, they were simply known as ‘Personnel’ and their job was relatively straight forward – pay and rations, hiring and firing and generally doing all the tiresome or unpleasant stuff that senior management couldn’t be bothered with. I remember someone in that line of work telling me that she was attracted to the job because she thought it was about being nice to people and helping them out, but actually it mostly involved saying no to any request with a smile on your face. 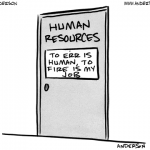 Somewhere along the line, Personnel became Human Resources. I’ve no doubt this was American management guru speak designed to talk up the job and suddenly the humble personnel officer got ambition. This was usually dressed up as ‘organisational development’ and Personnel were throwing money around on staff away days with facilitators and pseudo-psychological games designed to boost staff morale and team-bonding and doing the exact opposite. They were also fond of producing policies, reams and reams of them, that every member of staff had to keep in a three-inch think ring binder and be read from cover to cover. For example, we used to have a mobile phone policy that set out in detail when they should and shouldn’t be used. The top and bottom of it was that you shouldn’t use one while driving your car unless it was hands free, despite the fact that the country has a perfectly good law making such an act illegal whether you have a Personnel Human Resources Department or not. No wonder then that the only organisational development it truly succeeded at was in its own reputation for being up its own fundament, an image it presumably thinks it can lose by now calling itself People Services. My worry is that trying to soften its edges can only mean more money wasted, more timber felled for paper and more people being nasty with a smile on their face. Which reminds me of a joke. If you were faced with a werewolf, a vampire and an HR manager, but your gun only held two silver bullets, which would you shoot? 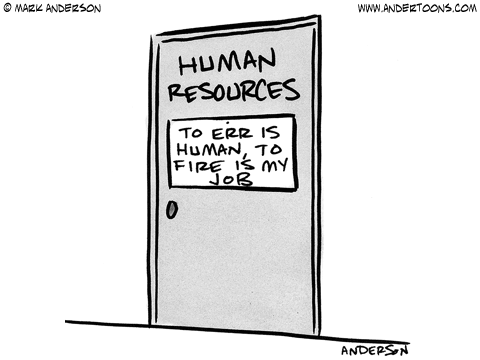 The HR manager twice, just to be sure. You are so right. Boy, did you hit this nail on the head! I wondered if I was being a little harsh. I have met some helpful and pleasant people who worked in personnel. But they seem to change when they switch to work mode, so I don’t regret this post at all!